I was dismayed by one Facebook response to that post. I think it was the shrug that hurt the most. Not because I was personally acquainted with this woman. And not because her comment was particularly insulting. It hurt because I suddenly found myself face-to-face (virtually speaking) with a person who claims to be a Christian but is completely missing the point. Dear Christ-following friends, we’re immersed in a land where millions of people want to be like the wise man who builds his house on the Rock. They want the security of the Rock. They want the stability of the Rock. They want the status of the Rock. But they staunchly refuse and stubbornly reject God’s explicit instructions for how to build there. Because building on the Rock isn’t just about calling yourself a Christian. It’s not about believing in God or even that Jesus existed or that He died on the cross. It’s not about living a moral life or accepting some of Christ’s teachings. And it’s not about being baptized or growing up in church or claiming a certain political party. What does the passage in Matthew 7 tell us? How do we become like the wise man who built his house on the rock? By hearing His words and doing them. Regardless of what our culture tells us or what’s politically correct. Regardless of how others might misinterpret our beliefs and how we might suffer for them. Too often, people who claim the name of Christ are guilty of picking and choosing which Scriptures to obey, and which ones to ignore. but we conveniently ignore the ones about gluttony. but we just can’t manage to forgive the person who wounded us so deeply. but we’re not so sure about the Bible’s teachings on divorce. but adamantly refuse to accept His definition of marriage. but we reserve the “right” to decide which lives are worth protecting and under which circumstances. James tells us that those of us who have access to the Bible and hear it and read it but don’t do it are victims of the worst kind of deception: self-deception. Let’s be doers of the word. In a way that makes a difference in the way we think and speak and behave. In a way that impacts our relationships and our social media and our recreation. 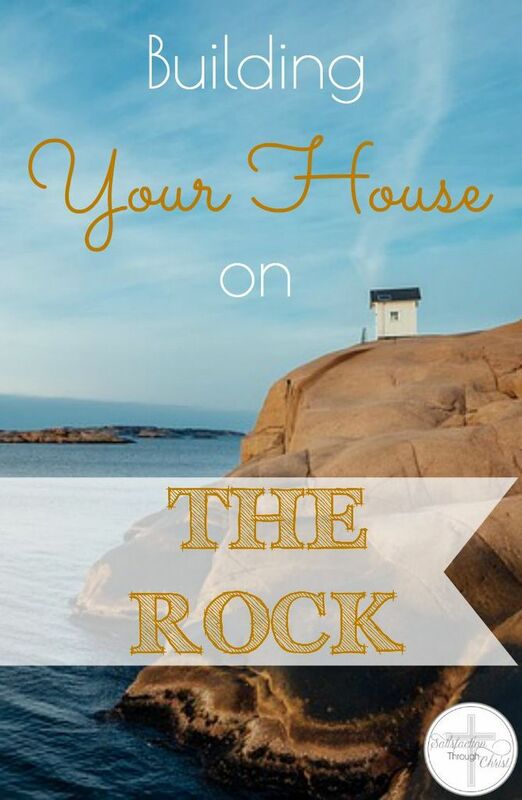 Because that’s what it means to build a house upon the Rock. Perhaps you would be encouraged by a printable statement of faith – a “Christ-follower’s manifesto” – worthy of framing and reading and living. You can get yours free by clicking here. Great truths here Jennifer! Praising God you are not ashamed to share them. Praying for myself and others to have a desire to be doers and not just hearers. Hi, Lisa, and thank you for stopping by! I join you in that prayer – we all need God’s grace to be effective doers with sensitive hearts and willing hands & feet. Jennifer, wonderful blog! Thank you for speaking truth and standing firm! May all Christ followers abide in His Word so that they will know the truth and then allow that truth to set them free. Amen! Abiding in His Word is so critical for us. Thank you, Deanna. Amen. Reflecting the whole counsel of God into our lives (not just the socially acceptable parts) is what it means to be built on the rock! So true, Helene! Thank you for stopping by. I know how you feel. Twice I’ve posted on Facebook expressing my outrage about the Planned Parenthood videos. I got very few “likes” or comments compared to what I get when I post pictures of my grandkids or things like that. It’s sad, I feel like the Christian community ought to be rising up and doing something but instead there seems to be apathy. It’s truly amazing in a sickening kind of way, isn’t it? I don’t get it, Jerralea. Even so, Lord, come quickly! Jerralea~I’ve been pulling back from Facebook…actually I have done it a few times before, but I don’t think I’ll waste time posting much anymore. It seems when I post things about food or something trivial, those posts get the most attention, but when I post something of a serious/important matter i.e. abortion, isis, Biblical discernment…those posts get hardly nothing, if anything. It’s sad really, but probably a picture of the apathy that some or most Christians have. Very discouraging for sure. Thanks for this Jennifer! I’ve read a few of your posts over the last couple months but this is the one that is making me head over to sign up for your newsletter as soon as I finish commenting. Its so important to be “doers” of the word and to follow the instructions to build upon the rock. I agree with you so much about how being a “convenient Christian” picking and choosing which principles to love, live, and preach and ignoring those that don’t fit our lifestyle doesn’t mean you are a Christian. I look forward to hearing more from you! Unless someone is a babe in Christ, there is no way one can be a Christian and pro-choice. Agreed, Becky. The “pro-choice” movement is in direct opposition to the teachings of the Bible.